Cancer research has progressed rapidly over the last few decades, with a growing repertoire of drugs to fight the deadly disease. Despite advances, treatment resistance remains a problem, particularly for treating solid tumors such as breast cancer. Drug combinations are one of the most effective ways to fight back, and a group of scientists at the Institute for Research in Biomedicine (IRB) in Barcelona reportedthe successful use of” or “the use of” bioinformatics to uncover previously untested pairs of breast cancer therapeutics. The study appeared in the journal Cancer Research. One way treatment resistance to cancer therapies occurs is when cancer cells evade destruction by using alternative signaling routes. 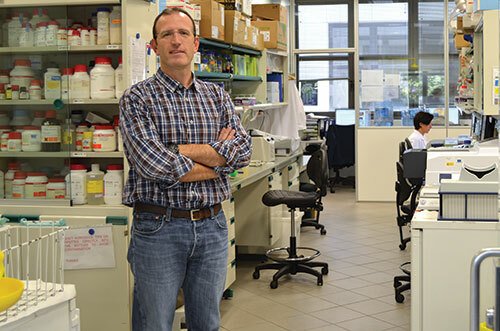 “What we realized within the literature and by attending talks is that one of the big problems of treatment relapse or resistance is crosstalk between pathways,” says Patrick Aloy, Ph.D., head of IRB’s Structural Bioinformatics and Network Biology Lab, and a co-author of the study. The researchers analyzed 64 breast cancer drugs in silico that were either currently in use or in clinical trials and discovered 390 novel drug combinations. From these, they chose ten to test in vitro on human breast tumor cells and found high level of synergy in seven of those combinations. As a final step, the group validated one of those pairs, the estrogen response modifier raloxifene and the c-Met/VEGFR2 kinase inhibitor cabozantibib, in a mouse model of breast cancer. Though each drug reduced tumor size on its own, together the drugs had an additive effect, shrinking tumors by an impressive 60 percent. Remarkably, they saw this effect with much smaller doses of raloxifene and cabozantibib than used in current treatments, three and 25 times, respectively.